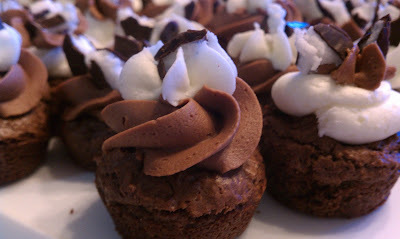 Girl Scout inspired: Thin Mint Brownies!!! Since the Girl Scouts are out selling cookies right now, I thought I would play around with some Thin Mints Cookies and my favorite brownie recipe! Lately, I have been baking everything in mini muffin pans, so here is my latest creation (with full pan instructions as well)! 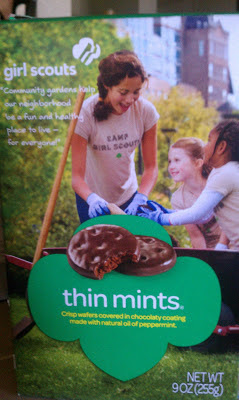 Girl Scout inspired Thin Mint Brownies!!! YUM! I added a Mint Buttercream Frosting and Peppermint Patty pieces for decoration, but it is not needed. Pre-heat the oven to 350 degrees. Spray non-stick spray into a 9x13 pan or 2 (24 count mini muffin pans). Pour butter mixture into a large bowl or stand mixer, beat in cocoa powder, eggs, salt, baking powder, and vanilla extract. Mix until well combined. Stir in the flour and chocolate chips/Thin Mint Cookie pieces until well combined. Spread into prepared pan or use a small cookie scoop to put batter in mini muffin pans (Note: batter will be very thick and sticky) and bake 25 in the 9x13 pan (do not over bake) or 8 minutes in the mini muffin pans (if you like fudge brownies bake on lower end). Cool on a wire rack. If you want chocolate buttercream frosting: Beat together two sticks of softened butter, slowly add in 4 cups of powdered sugar, 1 tsp of vanilla (or 1/2 tsp peppermint extract), a pinch of sea salt, 1/4 cup coco powder and add 2-4 Tbsp of milk as needed. Pipe or frost onto brownies. Add sprinkles or top with remaining Thin Mint Cookies or Peppermint Patties pieces! 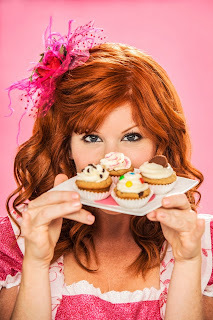 Today I am sharing the recipe for one of my favorite Signature Sweet Treats!!! 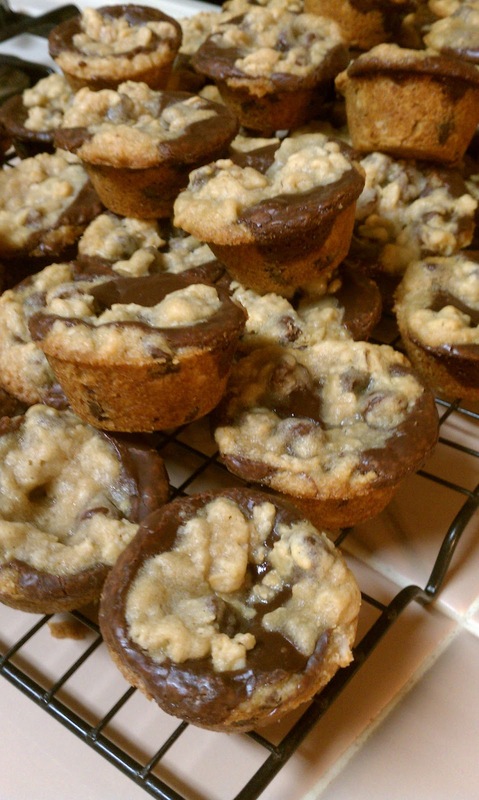 People LOVE these Fudgy Oatmeal Cookie Cups! 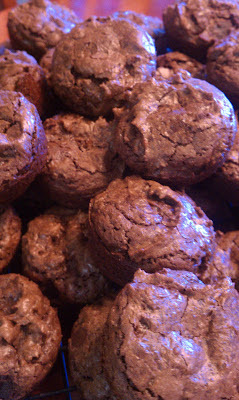 Originally a fudgy "bar" recipe that I later baked in mini muffin tins for individual bite sized goodness! Preheat oven to 350 degrees (temp should be set to 325 degrees if using darker pans). Lightly spray 2-24 count mini muffin pans with non-stick spray (this recipe makes at least 48 cookie cups but plan on a few more than that). In a large bowl, beat together 1 cup butter and brown sugar until fluffy. Mix in eggs and 1 tablespoon vanilla. In another bowl, combine oats, flour, baking soda, and 1 teaspoon salt; stir into butter mixture. Stir in 1 cup of mini chocolate chips. Set aside. In a medium saucepan, heat sweetened condensed milk, chocolate chips, 3 tablespoons butter, and 1/2 teaspoon salt over low heat, stirring until smooth. Remove from heat. Stir in 1 tablespoon vanilla. Using a small cookie scoop place cookie dough into muffin tins filling the cup 1/2 way to the top. Spread 1 tsp of the chocolate mixture evenly over the top of each cup, and dot each cup with the remaining oat mixture. Bake for 10 minutes in preheated oven. Let cool completely, then remove from pans. Removing them from the pans can be tricky, just wait for them to cool and use a knife to ease up the edges and then twist them out. 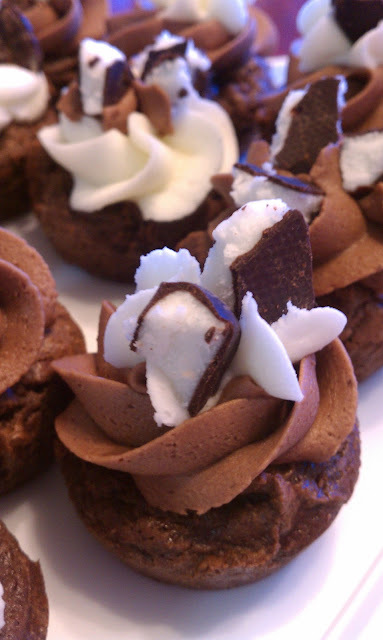 You can use muffin liners if you want too, but I prefer to ease them out of the pans so people can see the wonderful marbled look of the cookie cups! with amazing new recipes HERE! Be sure to "Like" Baking with Melissa on Facebook!